Image from January 1919 Suffolk Chronicle & Mercury newspaper. Born: 1890, Marks Tey, Essex. Died: 18th November 1918; age 28; of Pnemonia following Influenza – at Cambridge Hospital, Farnham, Surrey. Residence: 3, Rose Lane, Ipswich. 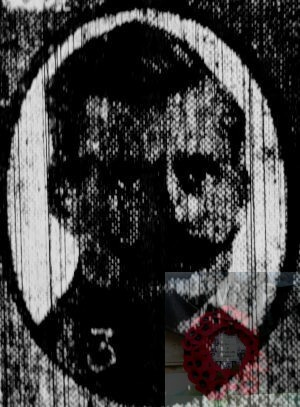 Enlistment Details: Date: 4th October 1915; Location: Ipswich; Age: 25 years; Occupation: Groom; Religion: CofE. Signed up for the duration of the war. Height: 5ft 6 ins. Arthur has seen 2 year and 3 months service in Egypt, Palestine, and France. Promoted: Lance Corporal – 14th October 1918. Admitted to hospital: 14th November 1918 – Influenza. Regiment: Royal Engineers, 52 Divisional Signal Coy. 1891 London Road, Marks Tey, Essex. Arthur was 6 months old and living with his parents & brother. Henry Amy, 22, a Porter, born Norwich, Norfolk. Eliza Amy (nee Sexton), 20, born Norwich. Henry William Amy, 2, born Marks Tey, Essex. 1901 London Road, Marks Tey, Essex. Henry, 32, a Railway Porter. Henry, 12, an Errand Boy. Albert Victor Amy, 9, born Marks Tey. Frederick Amy, 7, born Marks Tey. Amy Florence Amy, 5, born Marks Tey. 1911 Mount Street, Diss, Norfolk. Arthur was 20 years old, a Groom & married. He was living with his wife at her widowed, grandfather’s house. George Frost, 79, born Vauxhall, London. Louisa Eliza Amy, born July 1910, Diss, Norfolk. Dorothy May Amy, born January 1913, Ipswich. Evelyn Irene Amy, born April 1915, Ipswich. Cap badge, 2 discs, metal watches, pocket wallet, 1 pair of scissors, 2 packets of cigarettes, fork, whistle, earthenware ornament, correspondents, 4 plugs, tobacco, 1 pipe, holdall, hairbrush, 2 combs, razor, toothbrush & paste. Bag containing Testament, lather brush, pencil, laces, handkerchiefs, shaving soap, bayonet frog & 2 writing pads. Arthur is also remembered on the war memorial at St. Peter’s Church, Ipswich. The Royal Engineers “RE’s” were responsible for maintaining railways, roads, water supply, bridges and transport – allowing supplies to the armies. They operated the railways and inland waterways, maintained wireless, telephones and other communications signalling equipment. The RE’s designed and built the frontline fortifications, creating cover for the infantry and positions for the artillery. It was in the hands of the technically skilled RE’s to develop responses to chemical and underground warfare. The RE’s freed up the infantry and artillery. In 1915, in response to German mining of British trenches under the then static siege conditions of World War One, Tunnelling companies, nicknamed “the Moles”, were specialist units of the Corps of Royal Engineers within the British Army, formed to dig attacking tunnels under enemy lines during the war. The corps formed its own tunnelling companies. Manned by experienced coal miners from across the country, they operated with great success until 1917, when after the fixed positions broke, they built deep dugouts such as the Vampire dugout to protect troops from heavy shelling. By 1 August 1917, it had grown to a total of 295668. It was twelve times larger than the peacetime establishment.